A 200-million-year-old fossil that was found in a farmers field more than 60 years ago has been studied for the first time using cutting-edge CT scans. The almost fully intact ichthyosaur skull and mandible has been digitally reconstructed in a world first. 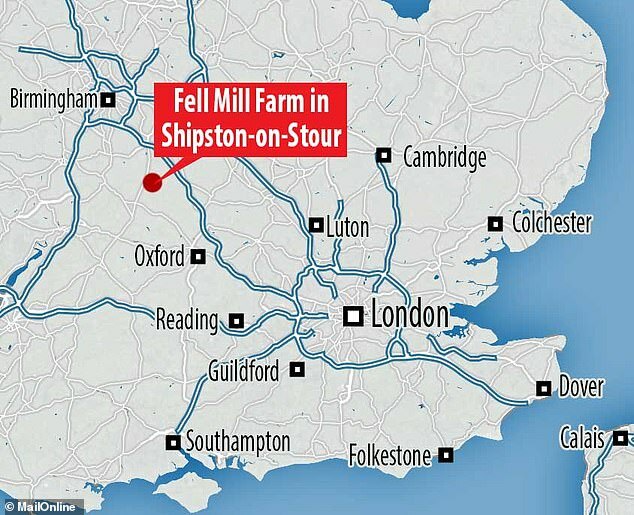 The well-preserved braincase was first found in 1955 at Fell Mill Farm in Shipston-on-Stour, Warwickshire. 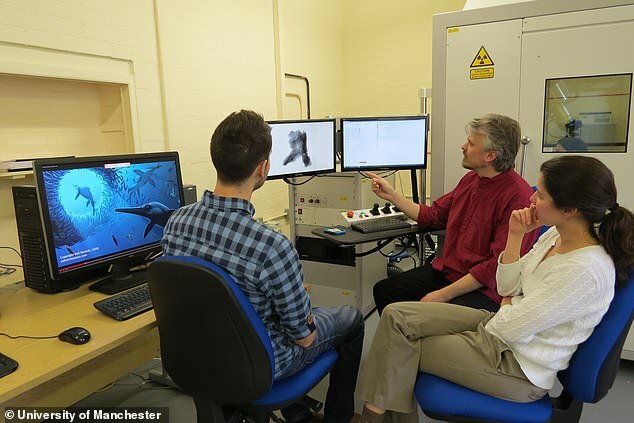 It is the first time a 3D impression of a skull and mandible of a large marine reptile has ever been made available for research purposes and to the public. In 2014, as part of a project at Thinktank Science Museum, Birmingham, palaeontologists Dean Lomax, of Manchester University, and Nigel Larkin began to study the skull and its incomplete skeleton. Study lead author Dean Lomax told MailOnline: ‘The skull is almost a metre (three feet) long and we estimate the entire body length to up to four metres long. 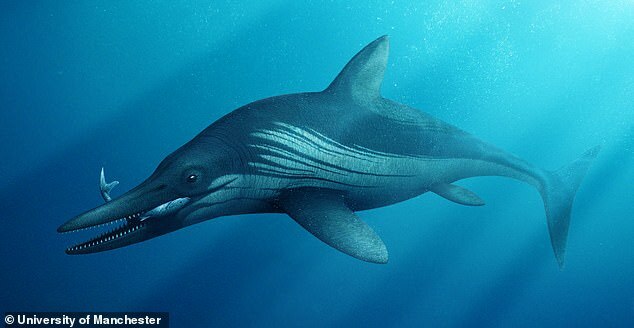 It was originally identified as a common species called Ichthyosaurus communis but later revealed by Mr Lomax’s analysis to be a far rarer species. Two pieces of research, including this paper published in the journal PeerJ, have concluded its skull features indicate it is the skull of a species called Protoichthyosaurus prostaxalis. The skull is almost twice as long as any other specimen of Protoichthyosaurus. Mr Lomax, one of the world’s leading ichthyosaur experts, said: ‘The first time I saw this specimen I was puzzled by its excellent preservation. ‘Ichthyosaurs of this Early Jurassic age are usually “pancaked”, meaning that they are squished so that the original structure of the skull is either not preserved or is distorted or damaged. Co-author Mr Larkin said the skull isn’t quite complete, but several bones of the braincase – which are rarely preserved in ichthyosaurs – are present. He added: ‘Initially, the aim of the project was to clean and conserve the skull and partially dismantle it to rebuild it more accurately, ready for redisplay at the Thinktank Museum. ‘But we soon realised that the individual bones of the skull were exceptionally well preserved in three dimensions, better than in any other ichthyosaur skull we’d seen. To unlock information contained in the skull, the bones were micro-CT scanned at Cambridge University by expert palaeontologist and co-author Dr Laura Porro. The fossil only preserved bones from the left side of the braincase but researchers used CT scans to digitally mirror and 3D print the remaining braincase to complete it. Finally, the entire skull was CT scanned at the Royal Veterinary College (RVC) using a scanner typically reserved for horses and other large animals. 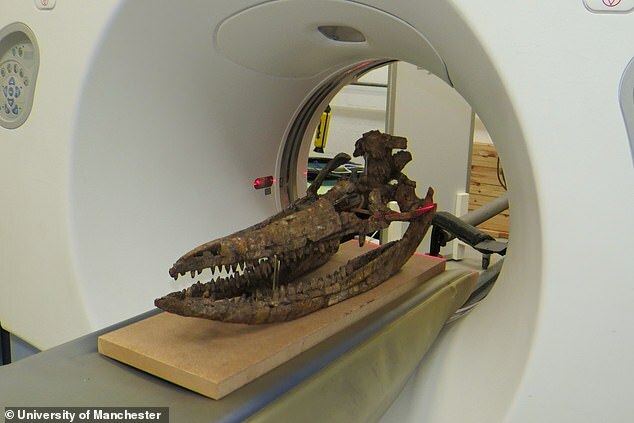 Dr Porro, of University College London (UCL), added: ‘CT scanning allows us to look inside fossils – in this case, we could see long canals within the skull bones that originally contained blood vessels and nerves. ‘Scans also revealed the curation history of the specimen since its discovery in the 1950s. ‘There were several areas reconstructed in plaster and clay, and one bone was so expertly modelled that only the scans revealed part of it was a fake. Mr Lomax added: ‘It’s taken more than half a century for this ichthyosaur to be studied and described, but it has been worth the wait. WHAT DO WE KNOW ABOUT THE ICHTHYOSAURUS? Ichthyosaurs were a highly successful group of sea-going reptiles that became extinct around 90 million years ago. They appeared during the Triassic, reached their peak during the Jurassic, and disappeared during the Cretaceous period. Often misidentified as swimming dinosaurs, these reptiles appeared before the first dinosaurs had emerged. They evolved from an as-yet unidentified land reptile that moved back into the water. The huge animals, which remained at the top of the food chain for millions of years, developed a streamlined, fish-like form built for speed. Scientists calculate that one species had a cruising speed of 22 mph (36 kmh). The largest species of ichthyosaur is thought to have grown to over 20 metres (65 ft) in length. The largest complete ichthyosaurus fossil ever discovered, at 3.5 metres (11ft), was found to have a foetus still inside its womb. Scientists said in August 2017 that the incomplete embryo was less than seven centimetres (2.7 inches) long and consisted of preserved vertebrae, a forefin, ribs and a few other bones. There was evidence the foetus was still developing in the womb when it died. The find added to evidence that ichthyosaurs gave birth to live young, unlike egg-laying dinosaurs.